Weight: 1/16 oz. 3/32 oz. 1/8 oz. 3/16 oz. 1/4 oz. 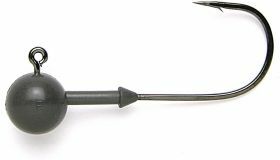 The Keitech Super Round tungsten jig heads are the finest lead-free jig heads currently available on the market. Their compact size-to-weight ratio, super sharp hooks and dense material are very effective for a variety of uses. Whether you are power fishing them with a swim bait, jerk-baiting them with a shad imitator, or finessing them with a Little Spider or wacky rig, there is a Super Round just right for the job. Note the 1/16 & 3/32 Keitech Tungsten Super Round Jig Heads come in a pack of 4. Note the 1/8 & 3/16 Keitech Tungsten Super Round Jig Heads come in a pack of 3.